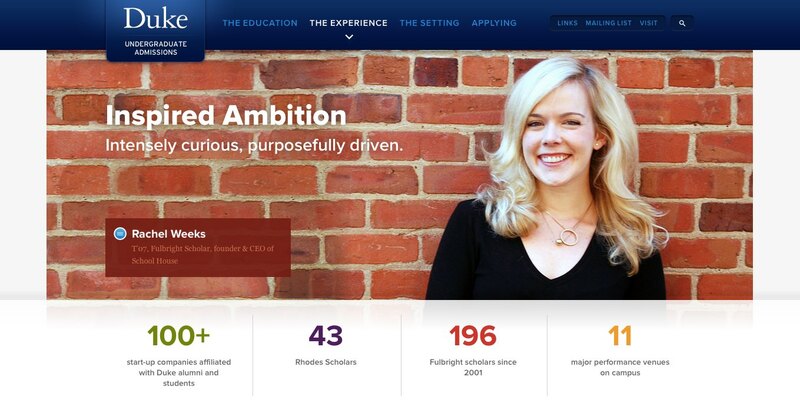 So, it’s time to redesign your college or university website. Where do you begin? How do you make the project a success? What are some things to watch out for? With so much to consider, the whole thing can seem daunting. Fortunately for you, Viget has years of experience creating award-winning .edu websites – Duke Forward and Admissions, University of Pennsylvania, and Johns Hopkins’ School of Advanced International Studies to name a few – and we’ve got some insights that will help your project go smoothly. Gauge how comfortable you are with change – Is your school comfortable with breaking some eggs (digitally, of course)? This can be tough to assess; but, it is vitally important that you honestly assess the extent to which stakeholders will be amenable to change. Are you more of a Duke Admissions, who asked us to scrap all of their content and information architecture in favor of new content and IA? Or are you more of a Duke Forward (the university’s giving site), who felt more comfortable maintaining a large part of their content and existing pathways? There’s no right or wrong approach, except to not discuss this at all before going through the vendor selection process. Plan stakeholder involvement – We know your organization has a number of faculty and administrators who want to be involved in the website redesign, and we welcome their input. However, we also know that their involvement will likely be sporadic, which means it needs to be planned carefully. Take our experience with the University of Pennsylvania, for example. There were 9 people on the day-to-tay team and even more indirect stakeholders above them, including Dr. Amy Gutmann, Penn’s President (and the person who had final say over everything). With numerous senior administrators in the decision loop, we learned early that we had to schedule review meetings with plenty of lead time and plan not to make any important decisions without stakeholder approval. Planning for stakeholder involvement from the start shaped our timeline and deliverables and helped us avoid derailments. Make data-driven decisions – We know each stakeholder has different priorities, and it can be easy to let internal politics guide decision-making. Try not to fall into this trap. Arguments can be avoided and time can be saved when you let data – both quantitative (insights into page views, click behavior, bounce rates, and more) and qualitative (understanding user goals, needs, behaviors, and motivations) – lead the way. 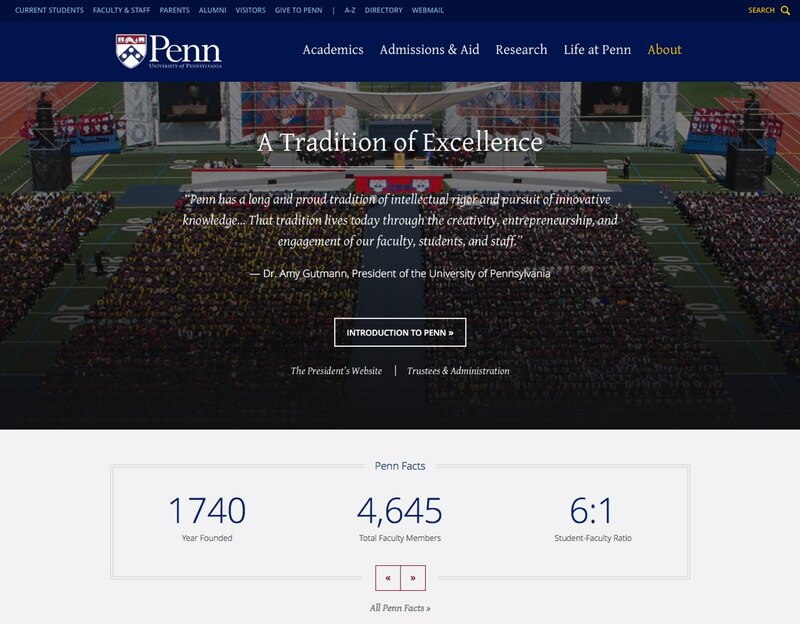 For example, analytics on the University of Pennsylvania’s website showed us that Penn Facts – high-level historical and current facts about the university – was one of the most popular sections on the website. However, the previous iteration of the site had Penn Facts buried a few levels deep, so we fixed that by placing it prominently at the top of the About page. Analytics showed us how important Penn Facts were to the site’s audience, so we featured them prominently on the About page. Don’t clutter the homepage – Cluttered homepages are usually the result of varied interests competing for homepage real estate and/or wanting to cater to too many audiences. We can prevent your homepage from becoming a dumping ground. Whether it’s running analytics to see where people are clicking, or figuring out which audiences to cater to (hint: it’s prospective students – alumni go straight to the alumni site, current students go straight to their portals, and faculty/staff typically have things bookmarked), we can can help you meaningfully elevate the right content so users aren’t going straight to the search box. 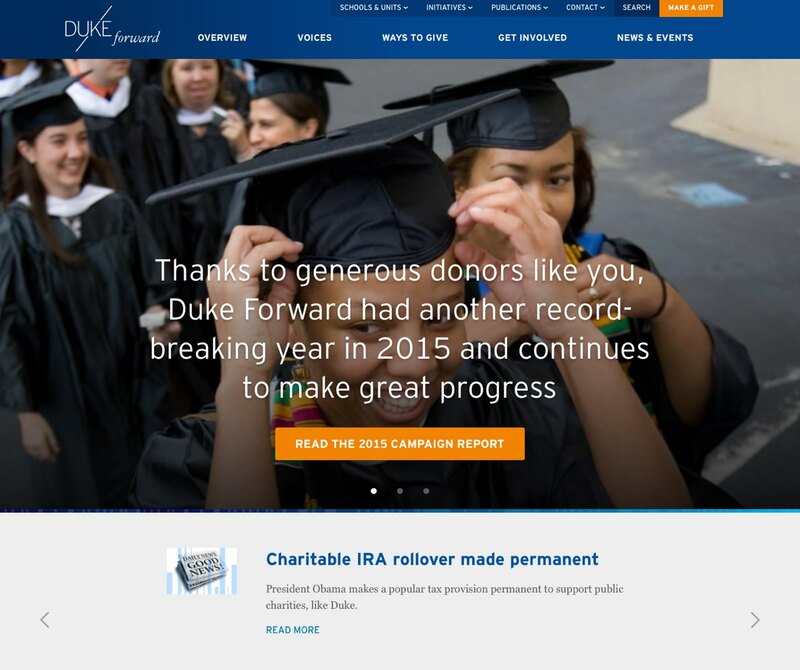 As you can see, we went with quality over quantity on the Duke Forward homepage. Giving the content space to breathe allows it to pack more punch. Treat side-door content like a first-class citizen – Did you know that many people enter your site not through the homepage, but through other interior pages (and some people never make it to the homepage)? Popular interior pages are a perfect place to elevate content that doesn’t quite belong on the homepage. Not only does dividing the wealth to places outside the homepage help avoid cognitive load and decision fatigue, it also creates the best experience for your users. Take Duke Admissions – it would be impossible to tell the story of all the benefits of a Duke education on the homepage, so we created a separate page where we could more thoroughly talk about its impact. Treating internal pages as king allows more room for storytelling and painting a full picture of what it’s like to attend your university. With Duke Admissions, we didn’t try to cram all of the important content onto the homepage, but figured out a site-wide narrative that let content shine. Plan for accessibility – At Viget, we believe accessibility is an essential element of any website and, as an institution for higher education, you may be required by the ADA to meet certain accessibility requirements. Don’t worry – we can bake accessibility into your site without blowing your budget. Choose your CMS carefully – Choosing the right CMS can be tricky. You may need to stick with your current one for various reasons; but, if you have room to choose a new one, carefully consider your content needs. Moving to a new CMS could make it easier for you to update and curate content overall. Get your content in shape earlier – We know you’ve got a lot on your mind, but remember that content is the star of the show here. Don’t let content get pushed to the last minute. Prior to your redesign, you should know how much content you have, who maintains it, what shape it’s in, what resources you have for creating new content, who will be creating new content, and how much guidance you need on the content creation/entry process. It’s not all about creating new content – It may seem like the biggest priority is to get new content ready. However, it’s just as important to remove or update old content, to introduce consistency in nomenclature and content organization, and to prepare for the long-term governance of your content (remember, it’s not just about getting content ready for the new site, but maintaining it over time). Sound scary? Don’t worry. We can help you create a plan just like we did for Johns Hopkins’ School of Advanced International Studies (SAIS). For the SAIS team, we created a content strategy guide that outlined each role and responsibility for each phase of the redesign. Not only was the content management process smooth throughout the project, but there was a system in place for long after we left. No students under trees, please – You know what we’re talking about. While we want to help you feature images that highlight the most beautiful parts of your campus, there are better ways to do it than this common cliche. You’re unique, and we’ll choose imagery that highlights the best of what you have to offer. 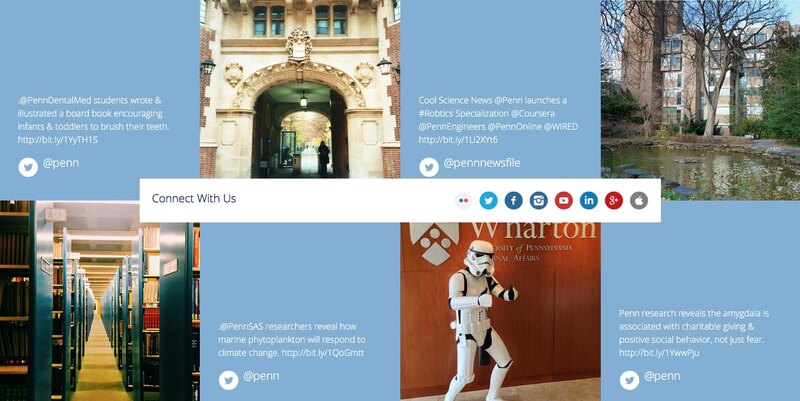 On the University of Pennsylvania’s website, we included a module that pulls in photos of Penn from Instagram. Curated by Penn’s communications team, this brings photos of the campus to the website that are beautiful, unique, and help tell the story of Penn. A university or college website redesign is a massive project, and you want to make sure you’re in good hands. Looking for a trusted partner? We’re always happy to help.